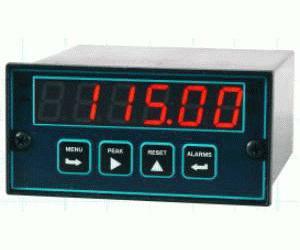 The Laureate™ True RMS meter offers a high accuracy 4 1/2 digit display for five voltage ranges and four current ranges. It is suited for AC applications where there is considerable distortion of current waveforms from nonlinear loading. The input is AC coupled to read only the AC component, such as ripple on a power supply. The True RMS meter uses precision circuitry to compute the root-mean-square of complex waveforms from 10 Hz to 10 kHz. Spikes up to 2.4 times the maximum of each range are accurately measured. This provides a crest factor (Vp / Vrms) of 240 for a signal amplitude of 1% of full scale, decreasing to 2.4 at 100% of full scale.